however for those of us FAR FAR below the Mason-Dixon Line it's a BIG deal. I mean really...didn't you see the news from Alabama & Atlanta. "up north" and they "know" how to drive in winter weather. Anyways...around our area the weather didn't start until late Tuesday afternoon. At 4 there was nothing by 5 this was my car's front window. By the time we got home...this was what it looked like. Needless to say I had one little boy dying to play, sled, build a snowman, and do all the other fun things kids love to do in the snow, so slowing down for Momma to take pictures was no fun. Baby boy however...this was his first snow. He was thoroughly unimpressed as far as I could tell. The big kid loved it! 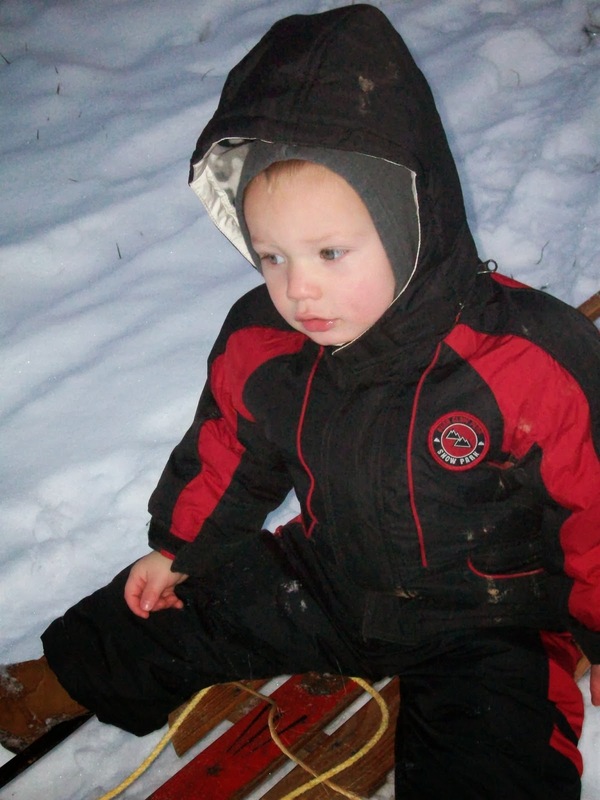 And that sled...is the same one William used as a child...perhaps even Nana. So needless to say yesterday the schools and the county was shut down. Today the schools are still closed and the county was delayed. Oh & the baby got to have his 1st Snow Cream...which of course he LOVED! Maybe next time~ which from what weather forecasters are saying maybe as early as next weekend. If it must come I pray it's here and gone by next Sunday (2/9) at 2 or I am going to have one very unhappy 6 year old! (it's going to be close to 60 here Sunday).